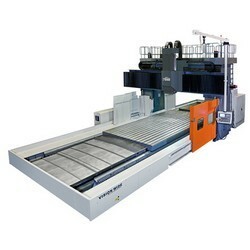 1.BM series 5 faces machines, with typical VW products features of rigid structure and high precision, is unique by the features of movable cross rail and W-axis feed cutting synchronic with other axial feeding. The max. height for work piece & machining is 2,450mm & 2,400mm. 2.The movable cross rail can be positioned precisely by dual synchronized servo motors driving system. Besides, it can carry precision feeding and heavy cutting on W-axis. 3.Rationing hydraulic system precisely control the parallelism of cross rail travel, even with different position of headstock on Y-travel. Dual cylinders offer strong supporting for W-axis smooth movement. 4.Double beams configuration: Fixed beam to keep the best parallelism and maintain the structure rigidity; Movable beam to have the dynamic straightness and sustain the cutting power. 5.Precise clamping device can hold the cross beam tightly, well controlling and supporting the spindle cutting accuracy. 6.Automatic horizontal and vertical tool changer.